For a week I had been limping around with a problem with my toe. Not my big toe but my next one. It all started when on holiday in Aruba 3 weeks ago. I was lining up a fantastic photo when shuffling forward to get the perfect shot I stubbed my big toe and next one to it on a concrete plinth. The big toe opened a wound and the next one hurt. Having laid around a lot and resting everything seemed OK.
On my return with the guiding and my own fishing plus working very hard in the meadow my toe began to hurt. Walking to Ashton Gate to watch BCFC on Sat and Tues had me in such pain. Then on weds I was due to be fishing on the H.Avon. Off I set in clear weather only for the fog to set in near Salisbury. I arrived to see no other cars in the car park. Great news! I loaded the gear not wanting to walk too far. I baited a few swims in a field near the car park. Slowly and painfully walking around in the boots was a trial. I saw a few barbel and even had some feeding. It was the very first swim where through the difficult low light and foggy conditions I thought I saw a good barbel feeding on the pellets. So I walked to the top swim and bought my tackle down to the bottom swim. Toe pain in creditable. I sat there for about 2 hrs looking into the swim and finally saw a mid double salmon swimming around. I reeled in and looked up stream again. 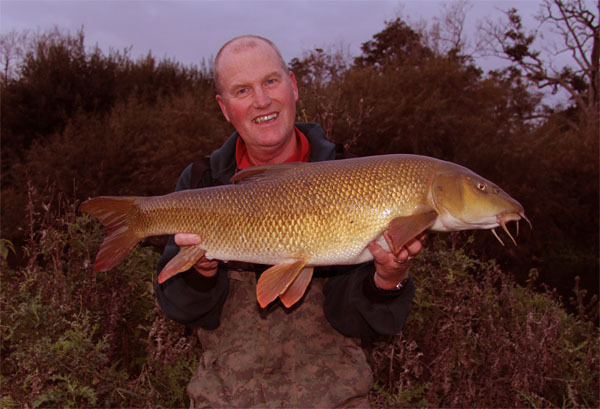 I saw a couple of barbel one of about 12lbs and another 9lbs. So I thought about moving. Returning and looking back into the swim I saw a big barbel feeding. So I waited until it went out of the swim. Lowering the bait onto the spot I felt confident. The fog then cleared and I could see nothing back into the swim. So after a further 1hr I decided to move swims. So I moved back up stream again. Boy oh boy did my toe hurt. I decided to stay put as I could see the occasional barbel go up and down the swim however not feeding. The cheeky 9lber would feed right under the rod time, however didn’t like line in the water even though I was back leading. So having spent 4 hrs in the swim I had about 1.5 hrs of daylight left so I wandered/ staggered back downstream to the original swim where I had first seen the barbel. I thought it was closer to the car. 5pm I cast out right on the spot where the barbel was seen feeding. I sat well back from the bank so not to alarm the fish. I hardly sat down for 10 mins when the free spool started to click nicely picking the rod up I found a great fighting barbel on the other end. I had set the clutch reasonably hard so I slackened it off as the barbel was fighting in the slacker water just in front of me. It tried to find the weed however I soon pulled it back into the slacker water again. She came to the surface and slapped it’s tail a couple of times as they do. It looked a good fish certainly a double. Slowly I had her tiring and soon in the net. A beautiful barbel lay in the net. Quickly unhooking her I rested her in a sack while I set the camera and scales up. On the scales she went 12lbs 12oz and looked a stunner. A few photo’s and she was soon back in the river recovering. Swimming off finally to find her friends. It’s not a pb but a great looking fish. So I recast and waited nothing happened other than it got dark. I packed everything away and limped back to the car and drove home. On getting home my toe was not a pretty sight, all swollen and black. I seriously thought about going to the Emergency Department such was the pain and looks of the thing. I decided though to give it a night to recover. Nest morning a visit to the local walk in surgery or in my case hop in they decided that I had broken the toe and it was not mending so I had a few tips on how to help the healing and fishing wasn’t one of them. So I have had to take 10 days off. This entry was posted on Monday, November 7th, 2016 at 10:16 pm	and is filed under Uncategorized. You can follow any responses to this entry through the RSS 2.0 feed. Both comments and pings are currently closed.